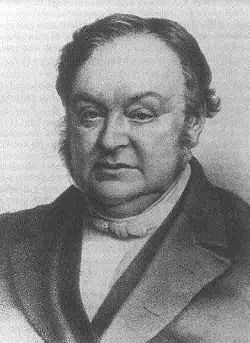 Johann Christoph Blumhardt (16 July 1805 – 25 February 1880) was a German Lutheran theologian, best known for his contribution in thought towards a kingdom-now or kingdom-come theology and his motto and centralization of Christianity around the idea that "Jesus is Victor." He was the father of Christoph Blumhardt. The phrase "Jesus is Victor" (aside from its Latin origin, Christus Victor) originated from the exorcism of Gottliebin Dittus that took place in Möttlingen in 1842. He wrote a book concerning the two-year-long possession of the girl and published it in the year 1850, entitled Blumhardt's Battle. According to the writing, the possessor was a widow who had killed two children and buried them in a field as well as a number of demons and the possessed was named "G.". It was said that the demonic manifestation ended one night with the demon shouting "Jesus is the victor". Blumhardt was considered by some as a hero on the basis of the incident, but he insisted that Christ was the hero, quoted as saying: "That I don´t know, but this I do know; Jesus is the victor". The event led to a revival in Blumhardt's parish. It was claimed there were many healings, conversions of some of the church’s most determined opponents, and radical transformations of life and character. Marriages were said to be saved and enemies reconciled amidst an outpouring of evangelistic zeal. Blumhardt's life after the exorcism was characterized by revivals and faith healings. In 1853 he purchased a thermal spa in Bad Boll to serve as a Christian retreat, where people came to seek his renowned healing abilities. He lived and worked there until his death in 1880. A biography of Johann Blumhardt written by Friedrich Zuendel was published in English as Pastor Johann Christoph Blumhardt: An Account of his Life (Cascade Books/Plough Publishing House 2010). Dieter Ising's biography "Johann Christoph Blumhardt--Life and Work" (Wipf and Stock 2009) provides historical and theological background for a modern assessment of Blumhardt.